The next step down the ladder in the classification system is the species. Here again, it can get a bit confusing but hang in there and you will soon understand it...I hope. A species name is formed by taking the genus name and adding what is called a specific epithet. This second word is comprised of a person's name, a descriptive term, a location name or some other word designated by the one who discovered the plant in the wild or later named the species. As we mentioned before, the words are all "Latinized." In some cases, the words are actual Latin or they may be words in English, Greek or other languages that people then translate into a Latin form by adding Latin suffixes or prefixes. For example, a man named Phillip von Siebold (more on him later) found several different types of hostas growing in Asia back in the 1800s. When he brought them to Europe, two of them were named in his honor. Thus we have Hosta sieboldiana (now H. 'Sieboldiana') and Hosta sieboldii as species names. As you can see, the species names consist of the genus name which is capitalized and the specific epithet which is almost always in lower case. Both are either italicized if machine printed or underlined if hand written. 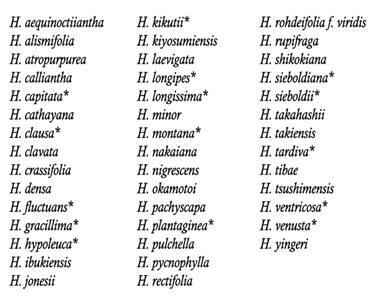 Up until Schmid (1991), there had been a lot of confusion over exactly how many species there are in the genus, Hosta. Taxonomists argue all the time over what actually traits to use to qualify a group of plants to be a species. However, for our purposes, we will narrow it down to a couple of key factors. One is that members of a species are able to freely interbreed and produce fertile offspring. The second factor is that a population of these plants currently resides in the "wild" or that there is evidence i.e. fossils, herbarium specimens, documents, etc. that show that they once did. * Indicates those species that you, as a Rookie hostaphile, are most likely to come into contact with as you become more familiar with hostas...at least, in my humble opinion.